← NEO Cosmo: Ruby Queen (Blue) circle lens review! 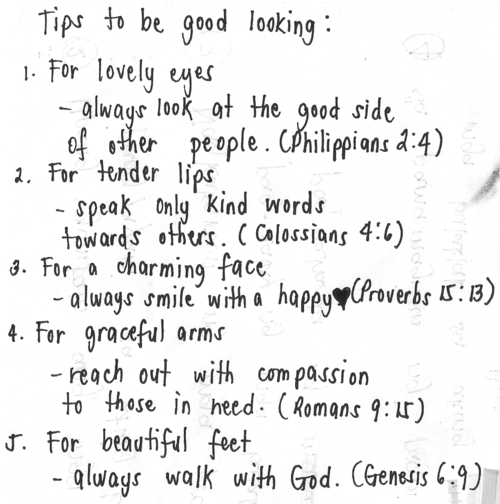 How to be a beautiful person. It’s true, the youth of our beauty is only fleeting. No matter how hard we try to tighten up the sagging skin, no matter how we coverup with makeup. We will age and life is short. Meanwhile the character of your heart will pull through to your last days. You don’t have to be a perfect person to be beautiful but quieten down your busy lives and try and see that there is so much more about life than it seems! The world you’ve built around you is much smaller than what God has in store! Living to see the better for others, living to understand, living to live. Now how great is that : D?! Here’s a thingo I just came across on tumblr. I’m not sure where it’s from so I shall link you all to where I found it.